Why in the hell would they put him on ESPN News?! That just makes me angry. Why even call it ESPN "News"? Every time you think that ESPN is taking some steps back to its roots, they take two gigantic leaps back with stunts like this. I fully expect MTV to be bought by Disney within the next ten years, and our regular ESPN programming to be relegated to ESPN2. It's just a matter of time. Nice to see homeboy wear a hockey hat. Disney buying MTV?!? Don't give them any ideas!!! 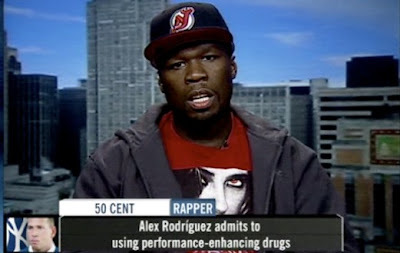 As random as it is, I think 50 cent is actually a pretty smart guy, and knows what he's talking about. WTF with the Devils hat ? just to let you you know, it was probably some real awful way for 50 cent to promote his new video game that was just released within the past week.